Every month, our BBQ Sauce of the Month Club features your choice of two BBQ sauces or a BBQ sauce and Rub. We look for the kinds of barbecue sauces that are truly unique from smaller, regional producers - the kind you are not apt to find at your local grocer. 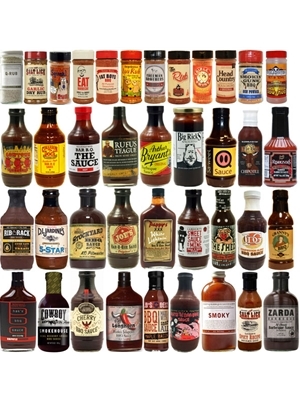 The BBQ sauces and rubs pictured here are just a few of the ones we have featured in our more than 11 years in business! So how do we find these sauces? We are at the food shows and cook offs and in the restaurants meeting the creators and hearing their stories. Over the years, we have literally tried thousands of different sauces and what you get are the best of the best of these. We bring the best and most unique BBQ sauces rubs to you or your gift recipient each and every month. And the best part is our low pricing as low as $17.92 per month! Ordering is simple: select your options below, review in the summary section, add to cart and checkout.